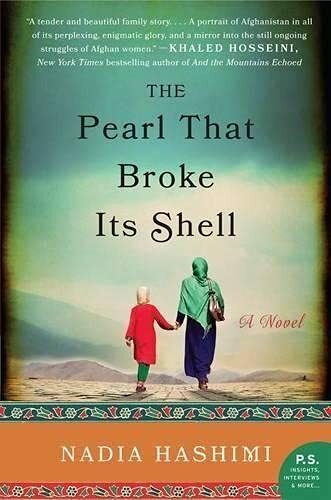 The Pearl that Broke its Shell, by Nadia Hashimi. The Pearl that Broke its Shell, by Nadia Hashimi. William Morrow Paperbacks (2015), Edition: Reprint, 480 pages. A touching novel about Afghani women, including two women, a century apart, who used their country’s tradition of posing as boys and men to survive, written by an Afghan American author. Nadia Hashimi’s parents left Afghanistan in the early 1970s, before the Soviet invasion. She herself was born and raised in New York and New Jersey and didn’t visit the country until 2002. Her extended family, however, kept the Afghan culture alive for her, regaling her with stories and characters which have made their way into her books. She graduated from Brandeis University with degrees in Middle Eastern Studies and Biology and then earned a medical degree. Now she lives in Maryland with her husband and four children and practices pediatric medicine. In The Pearl that Broke its Shell, Hashimi tells two interwoven stories. One is the story of Rahimi, a girl in Kabul in the early twenty-first century of the Taliban and American occupation. Her mother instructs her to dress and act as a boy in order to help the family cope with their difficulties. It is a lifestyle she enjoys, but then she is forced to marry a warlord and live in a very restricted world with his three other wives. Rahimi’s aunt tells her the story of Shekiba, her great great grandmother who had lived a century earlier. Scared by a fire, Shekiba had few options and worked for a time as a woman/man guarding the king’s harem and getting involved in dangerous events. Although Hashimi focuses on women following the Afghan tradition of bacha posh, of girls and woman acting as males, I thought the book’s best feature was its depiction of the subtle and ambiguous worlds of Afghan women, sometimes being supportive of each other and others betraying them, especially as multiple wives. At times Hashimi seems almost too strident in showing us their pain and their surprising strength. While I enjoyed the book, I thought it was less well-written than Hashimi’s later book, The House with No Windows. I gladly recommend this book and Hashimi’s other one to a variety of readers, especially those interested in women’s relationships in a variety of cultures. ← The Color of Our Sky, by Amita Trasi.